Optimized pre-treatment of untreated water is an important requirement for reliable and economic water desalination using pressure-driven membrane processes, such as nanofiltration or reverse osmosis. The main objective of the present study was, therefore, to assess and evaluate an automatic backflush filter AutoFilt RF3 as a pre-treatment filter when producing drinking water from brackish or salt water. The construction and function of the automatic filtration system and the design of the newly developed conical filter elements are presented first. In addition, there is a report on pilot projects conducted using the automatic backflush filter in the American water treatment plant “Indian River County” (Vero Beach, Florida) to evaluate filtration performance. This water treatment plant produces drinking water from brackish well water. The plant uses a typical treatment process which is essentially a pre-treatment using fine filtration and reverse osmosis installed downstream. Following the successful completion of the pilot projects, the system operator retrofitted an AutoFilt RF3-4 backflush filter. The continuous filtration of the solid contamination prior to the cartridge filters increased the service life of the cartridge filters dramatically. This significantly reduced the number of disposable elements required and meant that the system, in turn, required much less maintenance as a result of the extended intervals between element changes. In addition, the resulting reduced pressure drop across the cartridge filters reduced the electrical power consumption for the pumps, which has ultimately decreased the energy costs. This study has definitely been able to show that using an automatic backflush filter in the pre-filtration of reverse osmosis plants can result in a significant reduction in costs. In the last few years, membrane processes, such as reverse osmosis and nanofiltration, have become state-of-the-art in the production of drinking and service water from the sea or brackish water . The process generally consists of the following treatment phases: extraction of untreated water, pre-treatment, membrane filtration and, if required, a post treatment. The untreated water is pumped directly from the sea or from groundwater wells near the coast. To prevent coarse contamination entering the system, screens, strainers or coarse filters ranging in size from 1 to 5 mm are installed. In the next stage the untreated water is pre-treated to achieve the required feed water quality for the downstream nanofiltration or reverse osmosis. Generally, this is the most important step in the multi-stage water treatment process because the pre-treatment can strongly affect the economic efficiency of the membrane filtration downstream . For this reason – depending on the quality of the untreated water – other treatment processes are required for filtering out turbidity, suspended solids, colloids and, to a certain extent, organic matter. The processes frequently used are coagultion, flocculation, sand or flake filtration, as well as cartridge filters for fine filtration. A comparative study of different sand removal technologies has already demonstrated , , that the automatic backflush filter HYDAC AutoFilt RF3 with conical slotted tube filter elements is eminently suited to pre-filtration prior to membrane processes. The small footprint of the filter, continuous operation without loss of flow or pressure during back-flushing as well as high and reliable removal efficiency of particles down to 50 μm are the main advantages of this filter system, in comparison to other technologies. The design of the HYDAC AutoFilt RF3 guarantees optimum flow conditions in a compact unit with high filtration capacity and low pressure drop (Fig. 1). Various standard sizes enable flow rates of 5 to 10,000 m³ per hour. In the American water treatment plant, “Indian River County” (Florida) ground and brackish water is pumped from wells and is used for producing drinking water. The capacity of the whole plant is approx. 27,000 m3 per day. Fluctuations in the water table, changes in weather conditions and constantly changing water usage means that the pumped well water contains more and more sand particles which have to be filtered by a total of four cartridge filter stations. Each cartridge filter housing is designed for a flow velocity of 200 to 270 m3 per hour and is equipped with 102 off 40“ string wound cartridges – nominal filtration rating 5 to 15 μm. The normal life expectancy for these 40“ disposable filter elements is 3 to 6 months. In the water treatment plant Indian River County this service life was reduced to just two weeks because of the fine sand particles. After this short time a differential pressure of 0.7 bar was reached and the cartridge filter elements had to be replaced. A high maintenance input and an increased electricity usage due to high differential pressures are the result. 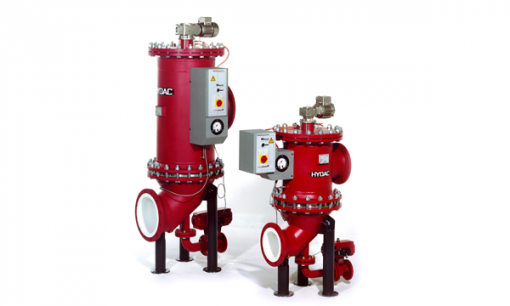 In order to be able to evaluate an automatic backflush filter for this application, initial pilot projects were carried out using a compact version of the HYDAC AutoFilt RF3. The RF3-C was installed offline prior to the inline filters, to demonstrate the removal efficiency of the sand particles. The AutoFilt RF3, Type C consists of six conical slotted tubes with a filtration rating of 50 μm and has a typical capacity of approx. 5 to 28 m3 per hour. The filtration area in operation is approx. 1780 cm2. The filter is operated in a flow range of 9 to 11 m3 per hour and at a primary pressure of 3.5 bar at the inlet. The water to be filtered flows through the conical slotted tube element of the backflushing filter passing from inside to outside (Fig. 2). Contamination particles are retained on the smooth inner side of the filter elements. The patented conical shape of the filter elements guarantees an even flow resulting in a low pressure drop and equal loading of the filter area. As the loading of the filter area increases steadily during the filtration process, the differential pressure between the contaminated and the clean sides of the filter element also increases. When the differential pressure reaches its pre-set value, the back-flushing process starts automatically. During back-flushing, a geared motor rotates the flushing arm under each filter element in succession and the back-flushing valve opens briefly. Since there is a pressure differential between the filtrate side (clean water) and the open back-flushing line, a small volume of the filtrate is flushed back through the filter elements. The contamination which has collected on the inside of the filter element is loosened and flushed out of the filter via the flushing arm. When all elements in the filter have been cleaned, the backflushing cycle is complete. The RF3-C was installed in the system for the pilot tests as shown in Fig. 3. The untreated water is taken from the contaminated side of one cartridge filter. It then goes through the 2“ flanged inlet of the RF3-C and is filtered through the 50 μm filter elements. Finally the filtrate leaves the automatic backflush filter and returns to the contaminated side of the neighbouring cartridge filter. This test set-up was selected deliberately because it could be implemented easily without additional pumps and without adversely affecting the current operation. Filtration tests were carried out over several weeks in continuous operation. Under these conditions the automatic backflush filter underwent 3 backflushing cycles per day, i.e. backflushing every 8 hours. The backflush fluid was collected in a 200-litre tank in order to be able to analyse the collected sand particles. The sand particles were separated from the backflush fluid and dried for an optical analysis. Figure 4 shows the distribution of the sand contamination removed. The diagram shows that approx. 17 % of the particles counted were actually smaller than 50 μm, which can be partly explained by caking of the particles in the filter element. Above all, the analysis shows that over 70% of the sand particles removed were between 50 and 500 μm in size. After successful completion of the pilot projects an AutoFilt RF3-4 with DN 400 nominal width was retrofitted in the water treatment plant and installed in front of the four inline filters (see Figure 5). Four untreated water streams – coming from the basement of the building – enter the RF3-4 through the inlet manifold and are filtered through the 50 μm slotted tube filter elements without installing an additional pump. After separation of the sand contaminants, the water flows through the outlet manifold to the different inlets of the four pre-filters which are connected in parallel. Following fine filtration, reverse osmosis membranes are applied as the main treatment stage to remove any remaining particles, and colloidal and bacterial contaminants and to reduce the ionic components. Finally, an injection of chemicals (e.g. fluoride and chlorine) is added to make the water fit for human consumption. Directly after commissioning the filter, it was clear that the continuous sand removal prior to inline filtration would extend the lifetime of the 40” cartridge filters substantially. The interval between element changes could immediately be extended from two weeks to approx. 3 months. This reduced the costs in terms of the string wound cartridge filter elements required the cost of replacing the elements and the inline filter maintenance. Furthermore, due to a slower increase in pressure drop during the filtration phase, the energy consumption of the pumps was reduced. This study has shown that HYDAC AutoFilt RF3 backflush filters are eminently suited to removing fine sand contaminants continuously from untreated water prior to cartridge filtration. The retrofitting at “Indian River County” water treatment plant with the RF3-4 demonstrates the economic and technical advantages of this concept. – An increase of process reliability by effectively preventing sand from entering the reverse osmosis. Furthermore, it could be shown that the retrofitting of an existing plant with a HYDAC AutoFilt RF3 is easily done because of the small space requirement of the filter and the flexible set-up. In addition, there are no foreseeable recurring costs, due to self-cleaning and robust stainless steel filter elements. Meanwhile, this concept has been used successfully in a number of other water treatment plants which had similar problems with fine sand contaminants.